Trenchless Sewer Line Repair permanently replaces and rehabilitates your sewer and water lines without digging up your foundation or yard. 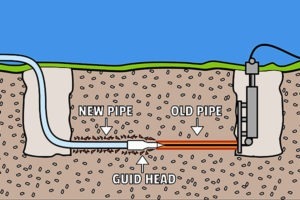 Trenchless repair can cost less than digging up your old pipes and replacing them. The experts at Schlueter Plumbing use state of the art technology to help clean and repair lines. We can answer any questions and will explain every step. Schlueter provides customers with the proper solution for sewer line issues without digging up your entire yard. Our trenchless sewer line repair includes adding sewer lining, pipe bursting to replace the traditional pipelines, directional drilling/boring, and other services to help remove roots and fix the issue permanently. Schedule an appointment today, we can help! © Copyright 2019 Schlueter Plumbing. All Rights Reserved.